The STABI-CEMENT RC construction method is a cement and asphalt emulsion stabilizing processing base course construction method (on-site base course recycling construction method) in which the road’s existing asphalt mixture and the base course are crushed and mixed at the same time with an asphalt emulsion and cement. In the STABI-CEMENT RC construction method, the asphalt emulsion “ASZOL A” is used, which has an outstanding ability to mix with the cement. ASZOL A is suitable for using with the nonionic emulsion “MN-1” for the cement and asphalt emulsion stabilization processing mixing. This method realizes both the flexibility of asphalt and the rigidity of cement, and compared to cement stabilization processing compounds it has outstanding freezing and thawing resistance and water resistance, which allows construction of base course that have durability. Due to the small amount of hardening contraction compared with cement stabilization processing compounds, the occurrence of contraction cracks reaching to the surface level will be inhibited. 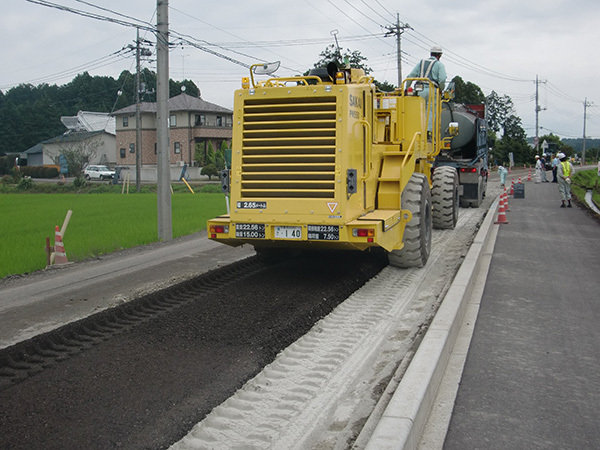 Because the majority of the existing paving is utilized on the site as it is, there will be little transporting in and out of materials, which will contribute to energy conservation, effective utilization of natural resources, and the limiting of CO2 emissions. 1.Since the work period can be made shorter than for the re-construction method, this method will be linked to reducing the economic losses due to construction work traffic congestion and will limit CO2 emissions. 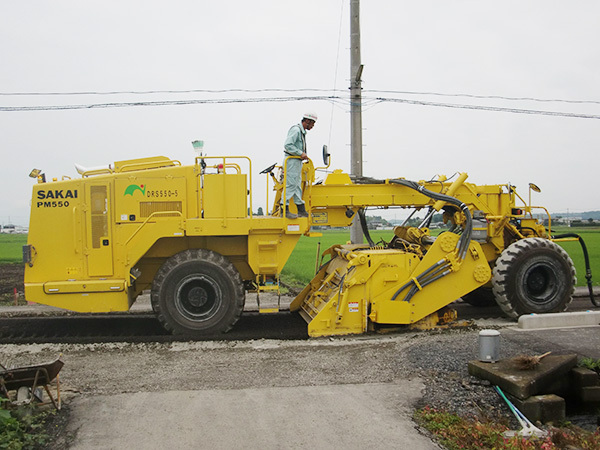 Because the existing paving is used as it is as aggregate, implementation can be carried out more cheaply than in previous repaving construction methods. 1.Conforms to the “Law on Promoting Green Purchasing”.